Here at Fairmont, we believe our teachers are superheroes! 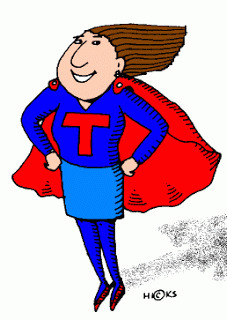 And when it comes to super powers, our early childhood educators have some of the coolest skills. Our ECE teachers can predict meltdowns and stop temper tantrums with a single bound. They seem to bring out the best in children without yelling or resorting to bad behavior themselves. Just how do they do it? Solving separation anxiety--Begin each day with a positive outlook. Take time to talk about the day before you leave for school. Try asking your child simple questions about their daily routine. “When you are at recess what is your favorite thing to do?” “I noticed your classroom has some great toys. What will you play with today?” Children develop confidence and security by following a routine. When it is time to leave your child, always say good bye. Give them a hug and send them on their way. Do not linger or keep coming back--this sends the message that something is wrong. Don’t panic if your child starts to cry. Have confidence in your child's teacher. Once a youngster has mastered a daily routine, he or she will be confident and content at school. Positive parenting--I have seen time and time again that children respond better to praise than punishment. When parents and teachers keep things positive, they see better results. Children want to feel that pat on the back even more than a reward. Keep everything positive! Using age to your advantage--"Age Advantage" is using a child's age as a motivation. For example, "When you are four you will be able to do X.” “When you are five you can do X." Also, it can work the other way around, for example: "Now that you are four you no longer need X,” or "Five year-olds don't do X." Mood matters--We have learned through teaching, as well as through parenting, that children will feed off your mood. If you are calm, they are more apt to be calm as well. You're in charge--Being a parent is wonderful, but it comes with responsibility. Parents are responsible for making decisions for their children. Children need guidance on what is in their best interest. Children are not capable of making those choices. Parents need to teach that there are consequences for good and bad behavior. Acknowledge when a child makes the right choice and have appropriate consequences when poor choices are consistently made. One hundred percent consistency is imperative and possible. This is where “mean what you say and say what you mean” comes into effect.